The 68-year-old captain of a tuna charter fishing boat died October 6 after going overboard. Stevie MacInnis of Arisaig, N.S., went into the water near Murphys Pond. His body was later recovered and brought to Port Hood. MacInnis ran a tuna chartering company called MacInnis Bluefin Tuna Charters with his vessel the Carrie Anne. Community members say MacInnis was the longest-serving fisherman from the 23 boats that fish out of Arisaig and a teacher and mentor to the younger generation of fishermen. The investigation into the tragic incident is ongoing. Three fishermen were rescued Sept. 12 by the Gulf ferry the Leif Ericson after their fishing vessel caught fire in the Cabot Strait. The 14-metre Sulia’n, owned by We’koqma’q First Nation, was about 90 kilometres northeast of Sydney, N.S., when the crew discovered a fire in the ceiling of the washroom, apparently caused by the boat’s exhaust. The captain, Blaine Hamilton and two crew, Christian Phillips and Levi Poulette, had set out from Cape Breton to fish redfish. 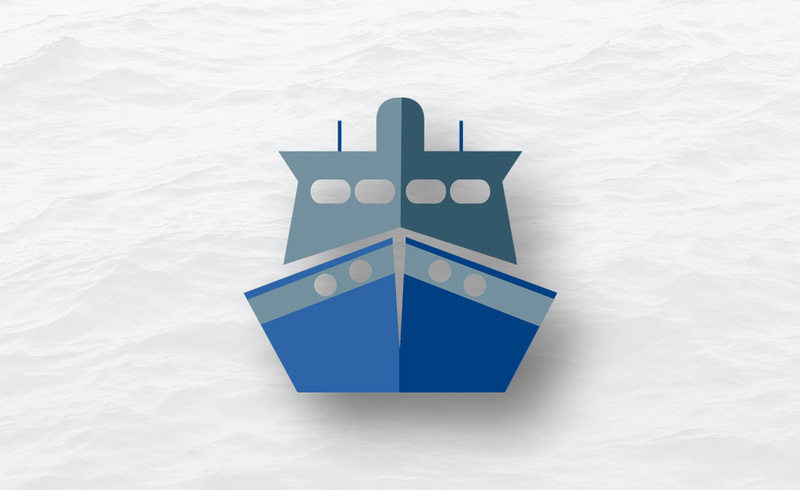 The Marine Atlantic ferry Leif Ericson, which was south of the burning vessel en-route to Port aux Basque and another vessel, the San Alessio, responded to the mayday from the Sulia’n. 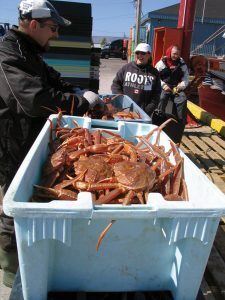 The Alaska Department of Fish and Game recently announced that the Bering Sea snow crab quota has received a 50 per cent increase over last year’s total. 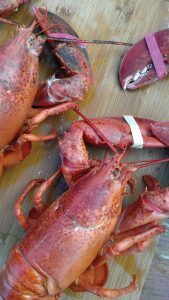 According to SeafoodNews.com, the increase is not that much, considering last year’s quota was the lowest quota since 1971. However, this year’s total allowable catch (TAC) of 27.581 million pounds will afford the crab industry an improved season when fishermen started pulling gear at noon on Oct. 15 in the Bering Sea district. Of the TAC, the IFQ fisheries will get 24,822,900 pounds and Community Development Quota will be 2,758,100 pounds. Snow crab or Opilio crab TACs had declined dramatically in the four years prior to 2017. The 2017 surveys showed improved recruitment, but fisheries managers kept the snow crab TAC low last year to aid in the population’s recovery. A higher quota for snow crab this year could have significant market implications. Last year, when the snow crab quota was so low, the vessel price rose to $4.07 per pound, the highest since at least 2004. The 2016–17 snow crab price was not nearly as high, at $2.67 per pound. Between 2004 and 2015, the price never went higher than $2.54 per pound. A wave of recent policy decisions, coupled with outdated regulations, are undermining investor confidence and straining Canada’s $7-billion fisheries sector, says the President of the Fisheries Council of Canada (FCC), Paul Lansbergen. Lansbergen recently outlined the challenges facing the sector to the members of the House of Commons Standing Committee on Finance, who are in the process of developing recommendations for the 2019 Federal Budget. Recent policy decisions ranging from involuntary relinquishment of fishing quota allocations under the government’s reconciliation agenda, significant expansion of marine protected areas and others have raised questions about stability of access to fisheries, which has given rise to increased investor caution. “Canada’s fisheries enjoy some incredible advantages that should have us positioned to win. We have a wide variety of high-quality harvested species in our waters, a rigorous food safety regime, top-notch labour standards, inclusive fisheries and collaboration with Indigenous partners and we are world leaders in third party certifications for sustainable fisheries practices,” says Lansbergen. “Despite advantages we’re slipping. Whereas 25 years ago Canada’s was the world’s number one exporter of seafood, we’re now eighth. Likewise, FCC called for renewed investments in science to ensure timely and regular fish stock assessments to improve fisheries management and promote evidence-based conservation practices. Lastly, FCC informed the finance committee many regulations affecting Canada’s fisheries are over 40 years old and are a drag on investment. Air Korea has provided cargo transportation service to Halifax for several years now. China’s cargo airline, Suparna Airlines, has also been a provider of such service to Halifax since 2017. This August, two more flights from Halifax to Changsha city of China were added. Each can carry about 120 tonnes of seafood to China every time. The Government of Canada, along with eight other States and the European Union, recently took a pivotal step towards oceans management and conservation by signing the Agreement to Prevent Unregulated High Seas Fisheries in the Central Arctic Ocean. Canada, Norway, Russia, the United States, China, Iceland, Japan, the Republic of Korea, the European Union and Denmark in respect of Greenland and the Faroe Islands, have signed this important, legally-binding agreement. It prohibits commercial fishing in the high seas portion of the Central Arctic Ocean for at least 16 years after entry into force. The Agreement covers an area about the size of Quebec and Ontario put together. This historic effort marks the first time an international agreement of this magnitude has been reached before any commercial fishing has taken place in a high seas area. Not only does it give the parties time to develop a greater understanding of this marine ecosystem and the species there, it will also inform possible conservation and management measures that might be needed in the future. Canada and the other parties have also committed to a program of joint scientific research and monitoring to gain a better knowledge of Arctic Ocean ecosystems and the potential for sustainable fisheries in the future. International interest in the Arctic continues to grow as climate change and the melting sea ice opens up vast areas of this once frozen landscape. The shrinking ice cover is affecting the traditional lifestyles of the Indigenous peoples of Canada’s North, a fact emphasized by Inuit Circumpolar Council during the negotiation of this Agreement. 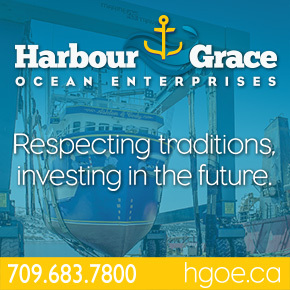 The Gael Force Group recently revealed its plans to expand its business overseas with the supply of a full and established range of marine equipment, technology and services to Atlantic Canada’s aquaculture market. The Gael Force Group, established in 1983, is a leading Scottish manufacturer and supplier of equipment, technology and services to aquaculture and other marine markets. The company plans on investing in Newfoundland and Labrador and establishing a new base to support the dedicated servicing of fish farms in the province where large growth in salmon production is currently being projected. Gael Force will supply and service customers with a full and established product range, including pen and barge moorings, plastic fish pens, concrete and steel feed barges, offshore feeding systems and pellet detection software and underwater technology including cameras and lighting. “Utilizing an invasive species to diversify fisheries resources may ultimately enhance the future resiliency of New England’s coastal communities and could serve as a unique example of how to mitigate and adapt to the ecological and socioeconomic impacts of climate-drive change,” Manomet Senior Fisheries Scientist Marissa McMahon said in a statement. European green crabs were introduced to the U.S. in the early 1800s. The invasive species has been thriving with the warming of the water in the Gulf of Mexico. McMahon is hopeful that Manomet will be able to replicate Italy’s lucrative soft-shell green crab fishery with the funding from NOAA. A study examining how women contribute to the survival of both fishing families and the fishing industry was recently launched by Memorial University of Newfoundland. 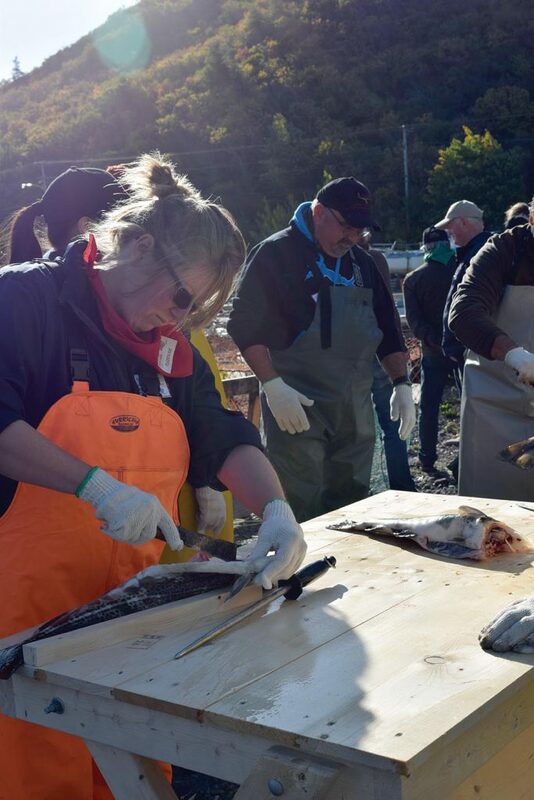 The research project, Women in Fisheries, is collecting data on both sides of the Atlantic — in Newfoundland and Labrador and in the U.K. — and intends to shed light on women’s roles, identities and well-being. Dr. Madeleine Gustavsson, a visiting post-doctoral fellow at Memorial University and a research fellow at the University of Exeter’s European Centre for Environment and Human Health, is leading the study and believes its timing is crucial. “Small-scale vessels make up 80 per cent of the fishing fleet in the U.K., yet receive only four per cent of the national fishing quota,” she said. Women in Fisheries is also hoping to understand how small-scale fishing families (those using boats under 10 metres in length) are adapting to a changing environmental and economic climate. “Listening to women’s stories is a central part of this research and the new website provides information about how people can sign up and take part,” said Gustavsson, adding that they are particularly interested in hearing from women on the Avalon and Burin peninsulas within the inshore/small boat sector. The site features a regularly updated news section where people can follow the project’s progress, read the latest research and discover other efforts to improve recognition of women in fisheries on local and international levels. Funded with support from an Economic and Social Research Council (U.K.) new investigator grant, the project is also working closely with the small-scale fisheries practitioners and advocacy groups such as the European Network of Women in Fisheries and Aquaculture (AKTEA), the Low Impact Fishers of Europe (LIFE) and the Coastal Producer Organization. Anyone interested in participating can register on the website or contact Gustavsson directly on Twitter @mcgustavsson. Clearwater Seafoods was given the gold award for outstanding e-commerce achievement, at the Canada China Business Excellence Awards in Toronto, Wednesday, Oct. 3, while the Government of Nova Scotia received the outstanding achievement silver award for its marketing work in China, which includes the Nova Scotia Seafood brand. In April 2016, Nova Scotia introduced Partnering for Success: The Nova Scotia — China Engagement Strategy, aimed at enhancing the province’s relationship with one of the world’s fastest growing market. No Replies to "On the Waterfront - November 2018"